"Toryou wa kouzou naibu ni tomei toryou (tan ao iro) wo mochii gaimen wa keikinzokuyou tokushu toryou (hai nezumi iro) wo hodokoshi hyoumen wa migaki shiage nari." "The paints to be used are transparent paint (light blue colour) for the interior and special paint for light metals (grey rat colour) for the exterior, and the surface is to have a polished finish." 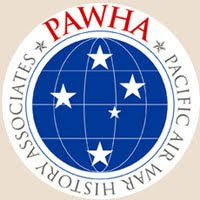 2,000 copies of this manual were published and distributed to the commands of all air related units for use by pilots and ground crew. 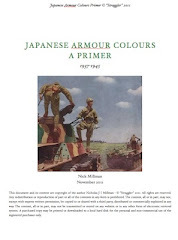 Noted Japanese researcher Katsushi Owaki advises that the early Zero was generally painted with a midcoat of colour I3 'Tsuchi iro' (earth or clay colour) and a topcoat of J3 'Hai iro' (ash or grey colour). 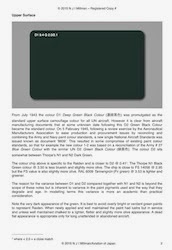 He cites a Munsell colour value of 7.5 Y 5.5/1.5 for the J3 chip in the IJN colour standards document Kariki 117 and notes that this is identical to the later 2-6 chip in the 1945 8609 document which rationalised Army and Navy colours. I have displayed a rendered chip of this colour. The closest standard Munsell colour value is 7.5 Y 5/2 @ 2.7 (too brown). The closest FS 595b comparison is 16350 @ 4.79 (too dark) and the closest RAL is 7034 Gelbgrau (Yellow grey) @ 3.33 (too light). In comparing the DE2000 differences a calculation of 2.0 less = a close match. FS 16350 is a value often cited for the early Zero, based on the current appearance of extant artifacts, but it is a little too dark. A model version should be lightened. Munsell 5 Y 5/2/FS 34201 is also cited for some extant Zero & Rufe artifacts and is very close to RAL 7002 'Olivgrau' (Olive grey) @ 1.37. Revell paint colour 32145 Helloliv (Light Olive) is supposed to be the equivalent to RAL 7003 but is closer in appearance to 7002. Again the colour is a little too dark for a model and should be lightened. Mitsubishi and Nakajima built Zeros demonstrate variations in the colour applied which will be explored further on specific airframes. For modellers please bear in mind that all extant samples are probably darker and more yellowed (browner) than the originals, including the paint chips. 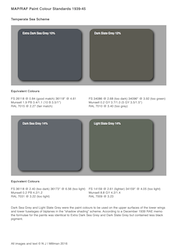 All these greys might be legitimately described as "grey rat colour". With gratitude to IM for translation and appreciation to Ken Glass for assistance in calculating Munsell fractional notations. 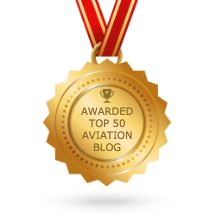 I posted a couple of my analysis from various Zero artifacts to J-Aircraft Com. 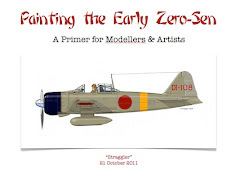 Please mention the difference between early Nakajima built Zeros and later ones. And Mitsubishi was the same gray to apply earlier to later Zeros. This is the colour of ---J3 but slightly tint umber(Ameiro)---. Thank you Owaki-san. I have added it and will post more from the samples you have kindly sent me.